One of the pleasures of participating in Urban Islands this past summer was meeting Johan Hybschmann, a recent graduate of the Bartlett School of Architecture and co-instructor, with Mark Smout, of one of the design studios hosted down there in Sydney. Johan is contagiously good-humored; even our pre-coffee, breakfast-less 7am ferry rides through cold winds across the Sydney Harbor in a surging boat were spent laughing. In fact, when I told him that my wife and I were about to celebrate our 7-year wedding anniversary... he started laughing. 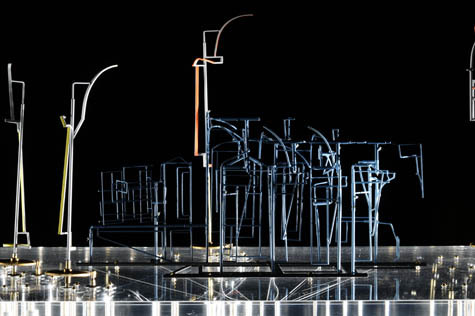 Johan's projects at the Bartlett were a fascinating mixture of ornate technical detailing and abstract ideas: simulation, reproduction, and the nature of spatial perception. "The idea of visually connecting spaces has been my architectural obsession for a long time," he wrote to me in an email after we had all returned from Sydney, "and I find that perceptual/referential recognition [of specific spatial details] often plays a key role." One of Johan's student projects, in particular, continues to astound me. What you're looking at in the images reproduced here (alongside Johan's answers to a series of questions I had posed over email) are painstakingly precise laser-cuts made into the pages of a blank sketchbook. 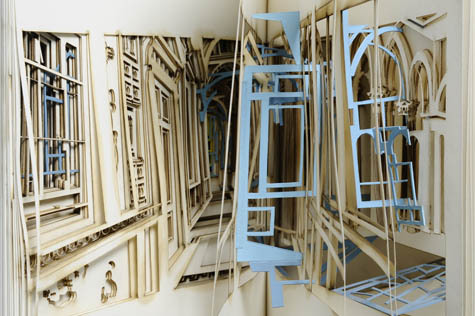 As the book is opened and its pages begin to turn, these cuts work together to form a spatial representation of the single, highly choreographed 90-minute shot that is Alexander Sokurov's film Russian Ark. 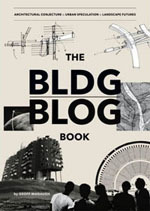 The book's "content" is thus a three-dimensional, perspectivally accurate space. The inspiration came directly from the single shot film sequence in Sokurov’s Russian Ark, where the camera is taken through the timeless spaces of the Winter Palace, jumping decades from one room to another. The distortion of time is, of course, interesting in terms of the timelessness of the spaces – but I was interested in the way that the camera never looks back. Even though the viewer never sees the full dimensions of these spaces, we are still left with a sense of coherence and wholeness. But what if the back of the room was mindblowingly different? It’s as if we constantly use the previous space to create an understanding of what should be behind us. 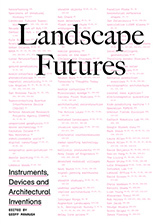 The book is an attempt to spatially prolong that perceptual idea. 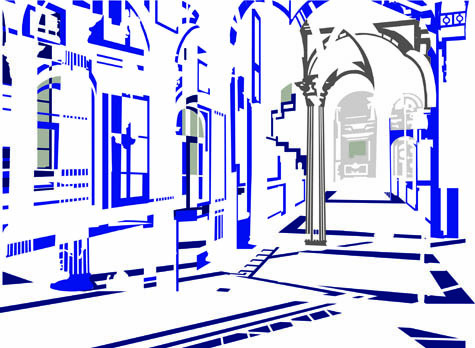 Two different spaces from the film sequence have been cut into each half of the book, as constructed perspectives. When the pages spread, the silhouettes of the elements visually collide, and the space within the book changes in character as the user travels through it by flicking through the pages. 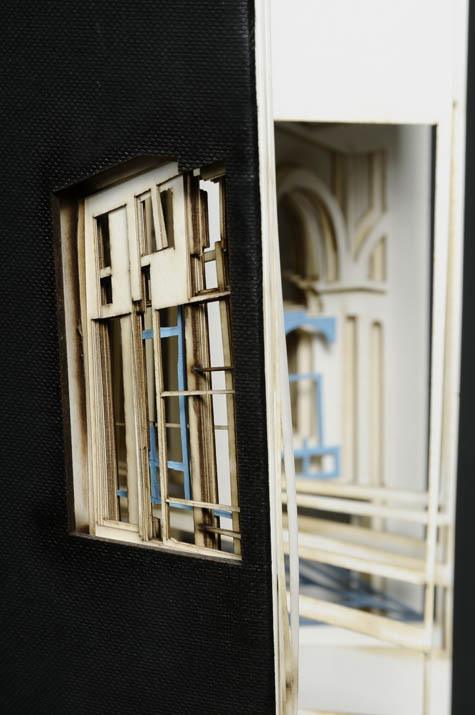 You pick up a book, and you open the covers... and a series of rooms begins to pass by, like the frames of a film or sequences in a flipbook, and it's all due to laser-cut gaps and remainders. 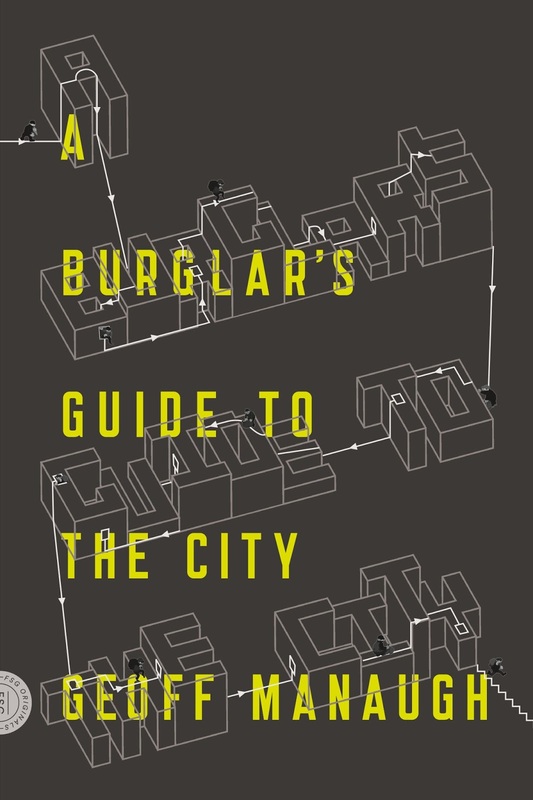 How amazing to think that we could slice entire works of architecture into all the books around us, so that "reading" a book would actually be a forward-moving optical journey through page-sized rooms and hallways. 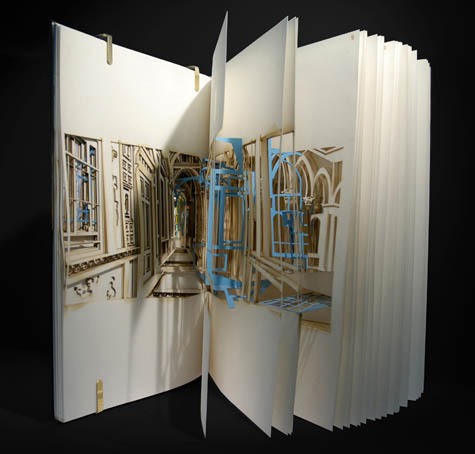 The book is made from layered silhouettes with inbuilt distorted perspectives that are laser-cut into the individual pages of a standard sketchbook. There is a drawing for each page, and these are all cut separately: turning the page, loading up a new drawing and cutting, page by page. Aside from the seemingly overwhelming task of working out exactly how much or how little needed to change with each page, Johan also achieved a kind of spatial layering effect: the turning pages add (or subtract) from the structure of each "scene" you see. [Image: The diagram of architectural outlines that was laser-cut into the book's pages, recreating the illusory volume of a cinematic space]. Rooms and perspectives shift; spaces blur one into the other, edited by laser; and the book re-enacts, on a bibliographic level, the act of watching Sokurov's film. 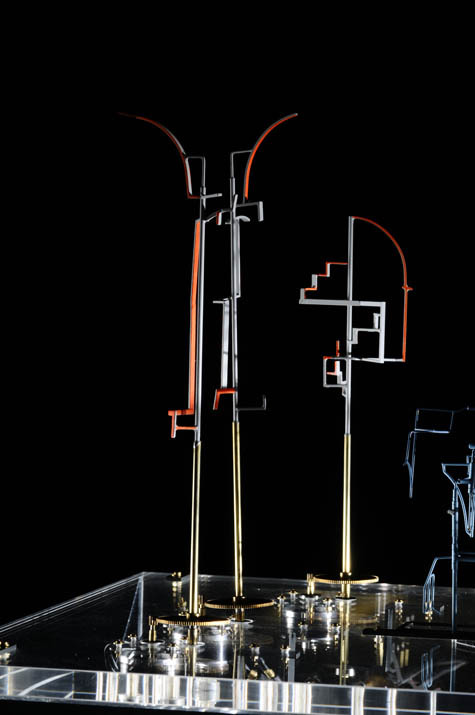 This project has a lot in common with another of Johan's student works. In the following project, called "Replicating a Replica," he proposed "a redesign of the Federal Hall on Wall Street in New York City." Johan basically created two buildings that would occupy the same place at the same time, visually interlocking but spatially separate. As you walk through the building, Johan explained, you would pass through a series of "choreographed viewpoints," or visual positions at which the spaces around you would shift. Here you would feel as if you are inside one particular building (a Museum of the Constitution, Johan suggests); there, even if only steps away, you would feel as if you were inside another building altogether (a Court of Law, for instance). Each building would exist as if tucked inside the optically complicated spaces of the other. After all, Johan added, he is "interested in the spatial potential of being in-between." 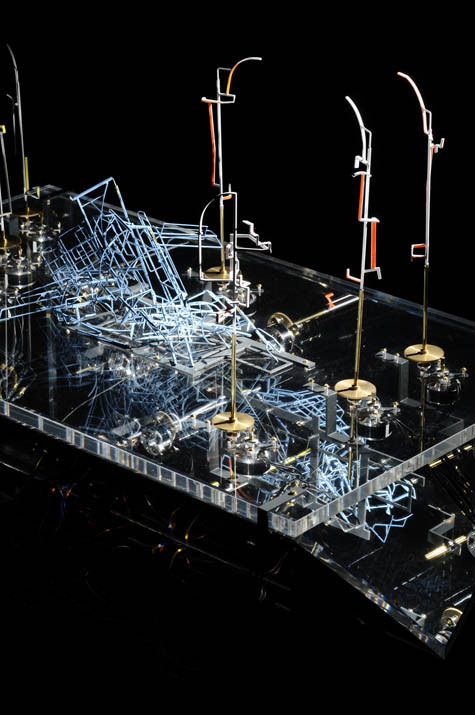 The resulting model of the project was thus more like a small machine, moving between two states of being. In one state, it was simply a pile of loose wire frames and disconnected vaults; in the other, a battery-powered act of reanimation has brought these apparently discarded parts whirling back to life, forming a functional building space. [Images: Another project by Johan Hybschmann]. The final images are fantastic: a building comes to life from whirring motors stored below. There is a scene in the film Blade Runner where Rick Deckard uses a machine to visually move around corners within a regular photograph. 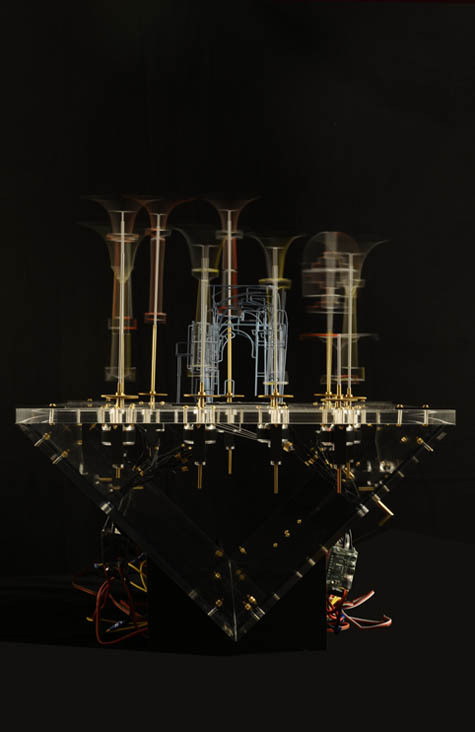 The machine traces all reflective surfaces in the “still-life” setting, and it collects information from objects represented from different spatial positions – but only from one viewpoint. This allows the machine to travel around the corner of the threshold within the photograph, but also to give an assumed image of what otherwise cannot be seen. Even though Rick Deckard gets a picture of a woman laying in a bed, we still have to consider that the image is constructed from distorted surfaces of mirrors and glass objects. In some ways, the above description of Blade Runner could also be a description of the convex mirrors deployed throughout the Sir John Soane Museum, which distort and re-reflect the sarcophagi and Egyptian statuary scattered all around the place, making even the definition of a single room somewhat hard to settle on. But it also ties in very nicely with the optical themes from Johan's and Mark's studio this summer in Sydney (which I hope to write about before too much longer): how we see architecture, how we visually comprehend built space, and what we might try to design in order to make this everyday experience both more complicated and more interesting. This looks interesting as everything on BLDGBLOG is, but I still can't figure out exactly what it is we're seeing in any of the photos. Is the perspective changing from one page to the next? Or are different components of one page used for the components of another page's structure? It's just too abstract and the photos didn't convey it any more concretely than the text. I'd really have to see a video of this to fully understand what it shows. Except where Eliasson's book seems like a static archiving of a dead space, Johan's seems animate. I guess it's the difference between a slice-by-slice forensic sectioning (like that gruesome medical project where they sliced up a human body at 1/2mm intervals); and the sequential frames of a film. Russian Ark has a kind of relentlessness to it which the book conjures up from a single frame. I agree with Doug, the photograph did not really do the article any justice. Saying this I am sure if you see it in real life it must be great! A very nice project in my opinion. I am happy to see projects like this, carried out in what seems like an almost childish enthusiastic manner. 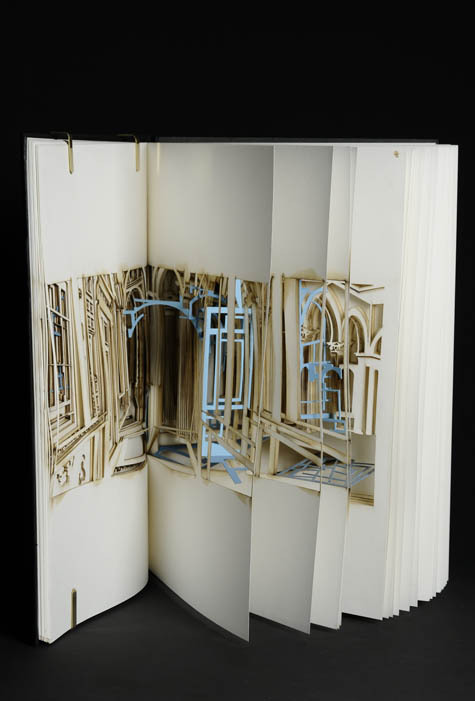 It reminds me of an intriguing work by a group of students at Lund University in Sweden; a laser-cut book, telling the story of Romeo and Juliet. Not as elaborate as Hybschmann's book, but equally interesting. The students' project was carried out during a workshop held by CJ Lim, who normally teaches at the Bartlett, where Hybschmann recently graduated. Mr Lim sure knows how to school his disciples, and he is a great teacher (once again, in my opinion). This is a fascinating post, It really inspires me to create spaces and objects that have multiple layers and readings. the section nature of the book reminds me of Mandy lorenz and Fahmida Zaman's entry to 2008's infobox competition. What an interesting interpretation of the Hermitage and the film Russian Ark! Having been to the building myself, I'm continually fascinated by others' perspectives on it - the book definitely explores the shifting depths and sense of layers inside. Thanks for sharing! Geoff, do you know how I can contact Johan? I am curating an exhibition that explores notions of the book and would like to include this work.